As regular readers will have seen here at the BPMA we have a stunning poster collection. 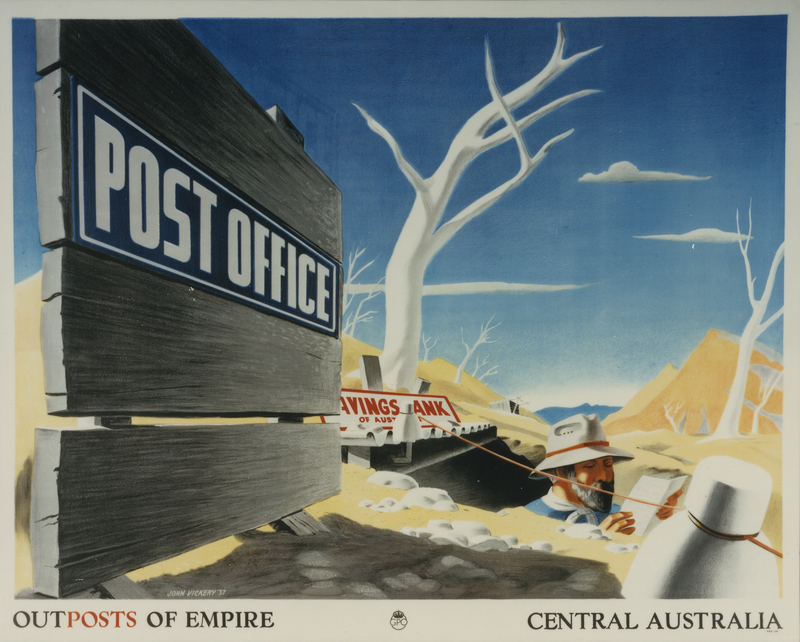 The General Post Office (GPO) was a trendsetting organisation, particularly when it came to marketing, and in the 1930s it broke the mould with its innovative poster designs. This Thursday (9 July) we’ll be offering the public a rare opportunity to own a piece of iconic design when we put a significant selection of vintage GPO posters (duplicate to our collections) up for online auction via Onslows Auction House. These stunning images come from this golden age of public relations at the GPO, between the 1930s and 1960s. 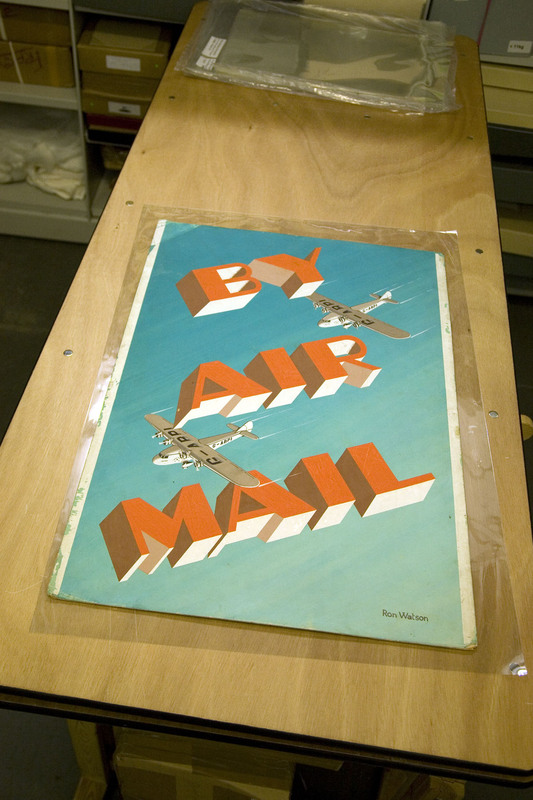 Some of the most prominent artists and designers of the time vied for commissions, creating striking posters on a range on subjects from airmail through to pleas for the careful packing of parcels. The posters to go on sale include works by Edward McKnight Kauffer, Tom Eckersley, John Armstrong, Jan Le Witt and George Him. Many of these artists went on to take commissions at places such as London Transport and the Ministry of Information where they created iconic designs to support the war effort during the Second World War. 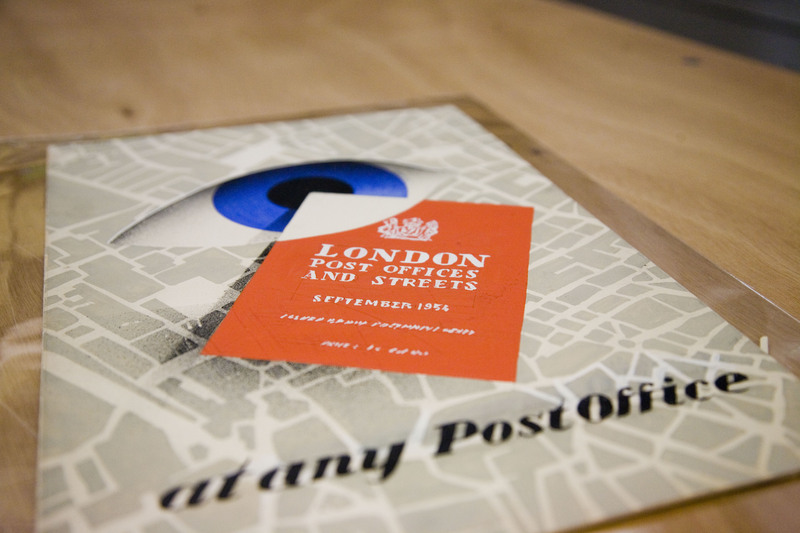 The money raised at auction will go towards delivering The Postal Museum and Mail Rail, where posters, and design more generally, will play a vital role in telling the remarkable stories of how the British postal service helped to shape our social and communications history. Please visit Onslows website to view the full auction catalogue. In this month’s edition of My Favourite Object, find out why our collection of poster artwork is so popular with Archivist Anna. 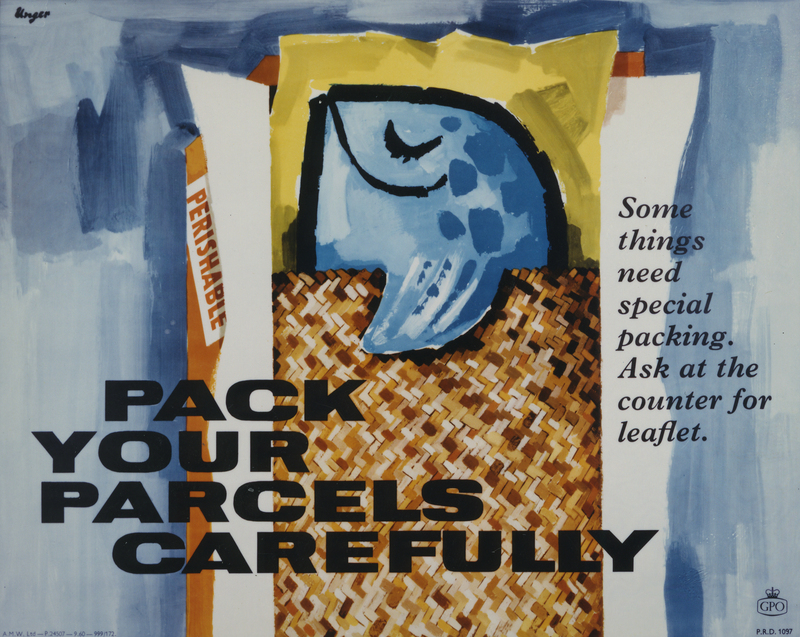 I am biased, having worked extensively with our collection of posters, but I believe the loveliest items in our archive collection are the artworks for posters produced by the General Post Office (GPO). They are catalogued and organised as a series, POST 109: Publicity Artwork and Designs, and comprise over 1200 items, including artwork for greetings telegrams. Possibly my favourite of the lot is this one. It was created by the artists collectively known as Lewitt-Him (Jan Le Witt and George Him), sometime around 1950. The artwork is a combination of paint on board, with a photomontage silhouette of a postman carrying a GPO mail sack, depicting a sorting frame. The colours are lovely, and still as vivid today, whilst the design is so effective, clever and simple that it’s a real shame it doesn’t appear to have made it to publication. The artists, Le Witt and Him, set up the Lewitt-Him design partnership in Warsaw, moving to London in 1937, where they found themselves amongst a growing number of talented artistic émigrés. 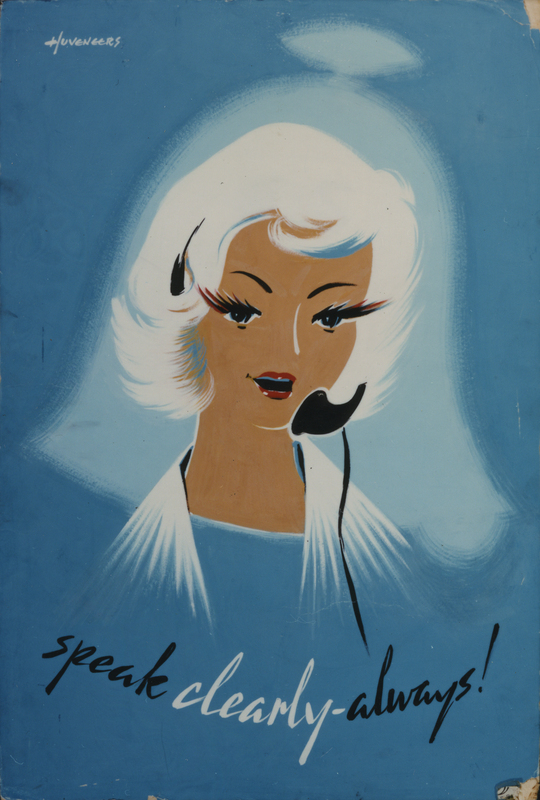 They produced a number of war time posters, book illustrations and advertisements, including posters for the GPO in the 1940s and 50s, which we are lucky to have in our collections. 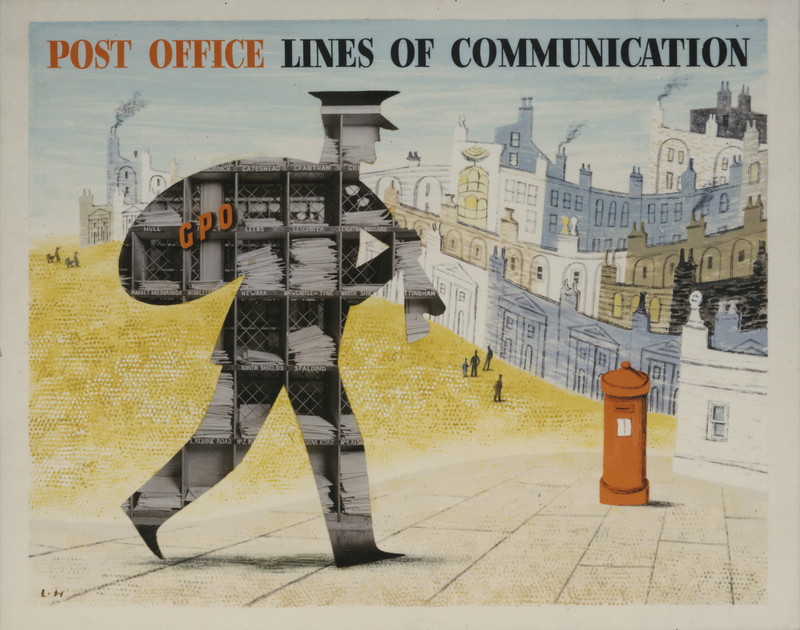 We hold eight poster artworks on the Post Office Lines of Communication theme, by artists including Hans Schleger (Zero), John Rowland Barker (Kraber), Frederic Henri Kay Henrion, and Pat Keely. Schleger and Henrion were also émigré artists. Having done a bit of investigation a few years ago into the background of these Lines of Communication artworks I was disappointed not to uncover any information in our archives regarding their commission or production. This blog reaches a similar conclusion that they were probably never produced. Incidentally, this is a great blog for vintage poster enthusiasts and has often featured a number of the gorgeous posters we have in our collections at the BPMA. Before I sign off, here are a couple of other poster/artwork images from our collections I adore. Chosen solely because looking at them makes me happy! I think it has something to do with the eyes – the contented expression of the fish, snugly wrapped up in greaseproof paper, and the elongated and multicoloured eyelashes of the telephonist. I bet she had a lovely voice! She’s actually part of a series of posters, which I wrote about a few years ago, and the others in the series are equally gorgeous and well worth a look. For Explore Your Archive week, Head of Archives and Records Management Vicky Parkinson introduces her favourite item from our archive…well at least her favourite of the week! “How do you feel about us filming a short ‘soundbite’ of you talking about ‘your favourite item’ while you are at the Conference next week?” started the email from the Head of Public Affairs at Archives and Records Association (ARA). “Why not!” I thought, I can put my media training to use, and so I started to think about what my favourite item in the archive is. When you have around two and a half miles of shelving filled with archival material, dating back to 1636, it’s pretty hard to pick one item that’s your favourite. So maybe I should choose a series first, perhaps something I enjoy showing people when I do a tour of the archive? No doubt as to what that is, I love showing people our posters. Most people have hazy preconceptions of what will be in our archive before they come on a tour, and it’s fun to challenge those. Regular readers of our blog will know that we love the posters and will use them wherever we can to illustrate articles. What’s not to love about a series of posters that starts at the golden age of public relations? Each poster is stunning in its own right, together they show the development of so many things: the use of PR in the Post Office, the changing services it provided, the issues that were important to the organisation (you just have to look at how many Post Early for Christmas campaigns there have been to realise what a big issue it is for the postal service every year), the development of design and the move to computerised design in the 1980s, to name a few. Watching people’s eyes light up when I open the draws and start bringing out the bright colourful posters reminds me what an amazing job I have. As amazing as the posters are I love the artwork for the posters even more. In this age of technology it’s easy to take design for granted, one look at poster artwork reminds you what an amazing skill the designers had. You can see every brush stroke, see the pencil lines drawn to help keep lettering straight, see where they’ve stuck additional bits on, where there were fiddly bits that would have ruined the picture if they’d tried to paint in on directly. Unfortunately they’re also rather fragile, much more fragile than the posters, which means that we can’t handle them too much and so I don’t look at them as frequently and don’t know them as well. Just before the ARA conference I took an artist down to the posters to give him some ideas of what we had, so that he could start thinking about how to engage a class of children in a project we were working together on. It was whilst preparing for this visit that I came across a wonderful piece of poster artwork (POST 109/158) and had a true wow moment. We don’t have the poster for this, so this was the first time I had come across it. The colours pop in real life, and the text is bold. One of these days I will find the time to look through the records relating to poster design and see what I can find out about the artwork, and the artist, but the poster artwork itself stands on its own without any accompanying information, and little information on the poster itself. 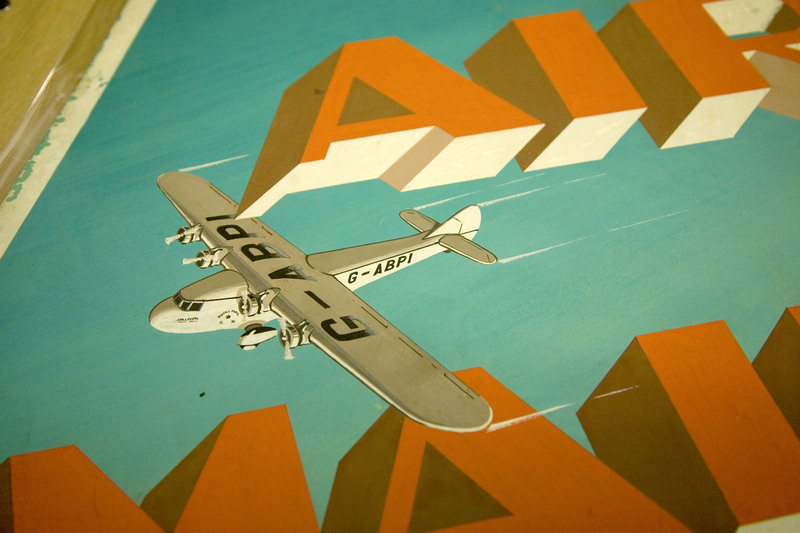 It shows the story of the GPO in the mid-1930s, and using graphic designers, it challenges the old fashioned art establishment, illustrating the pioneering go-getting nature of the GPO with its deliciously sleek airmail planes. Ask me again in a few months time and I may very well have a different favourite item in the archive, that’s the joy of having two miles and a half of shelving containing records that document 378 years of postal history! With almost 120,000 records now available on our online catalogue our Archive Catalogue & Project Manager Gavin McGuffie tells us about some of these exciting documents. Last Thursday we uploaded nearly 2,500 new records to our online catalogue, mostly publicity posters (POST 110) and legal cases and opinions (POST 74). 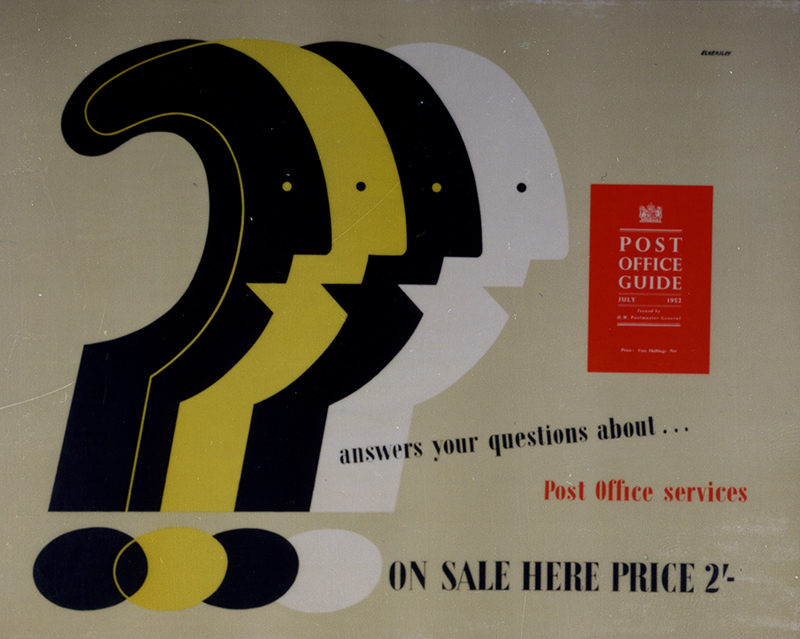 We now have images of almost 2,500 GPO posters available to view on our online catalogue [since there are about 6,000 poster descriptions on the catalogue] spanning the advent of Post Office Poster design, through the golden age of the GPO Public relations department from 1933-1960, right through to the present day Over the years the GPO commissioned some of the biggest names in graphic design to produce work for them including Edward McKnight Kauffer, Barnett Freedman, Frank Newbould, Austin Cooper and the partnership Lewitt-Him. 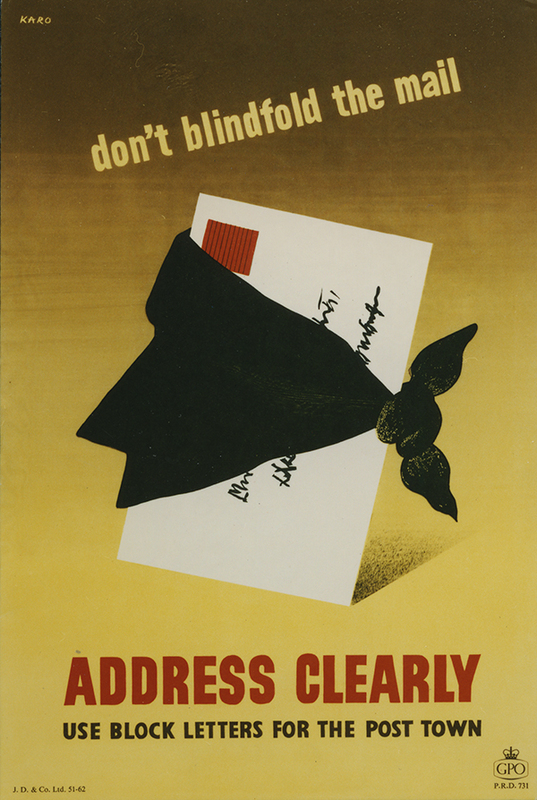 The posters cover a whole range of subjects including the Post Early campaign, the sending of airgraphs during the Second World War, the Post Office Savings Bank, airmail, and a number of internal staff advisory posters. The Cases and Opinions also provide a fascinating insight into the history of the Post Office. “Cases” were requests for legal advice written by members of the General Post Office’s Solicitor’s Department to external legal chambers and the “opinions” were the advice provided. The contents of these correspondences include road tolls, franking, explosive articles contained in letters, and bankrupts’ letters, giving us a window into the types of legal matters the Post Office was concerned with at various periods during its history, which very often reflected greater social issues. The upload completes the cataloguing of Cases and Opinions, which was begun in 2012 by a University College London student. 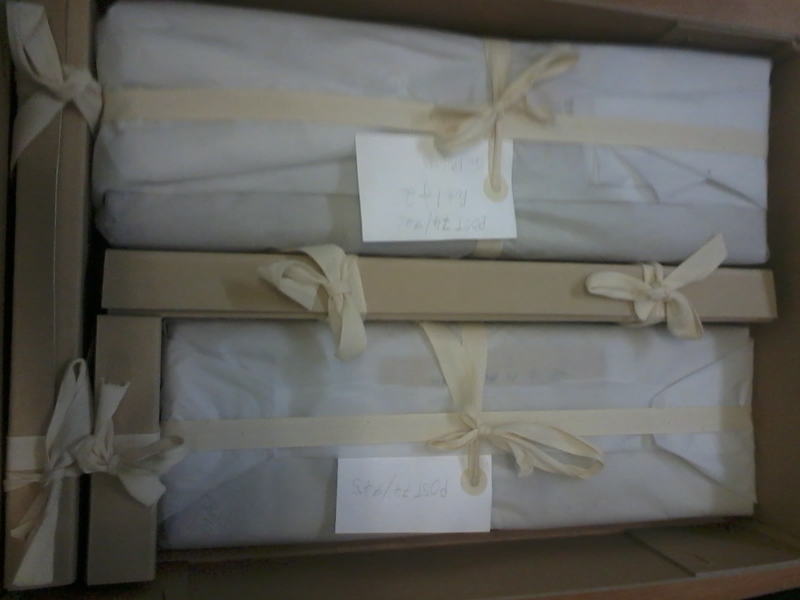 This work has been made possible by our volunteers who have listed record titles, which form the basis of the catalogue entries, while cleaning, repacking and re-housing materials for our forthcoming move. With only a few days left until Christmas Day we have been collaborating on an exciting new exhibition that explores the fundamental importance of the post at Christmas time. Our festive exhibition, Christmas through the post, has been developed in collaboration with Beverley Art Gallery. 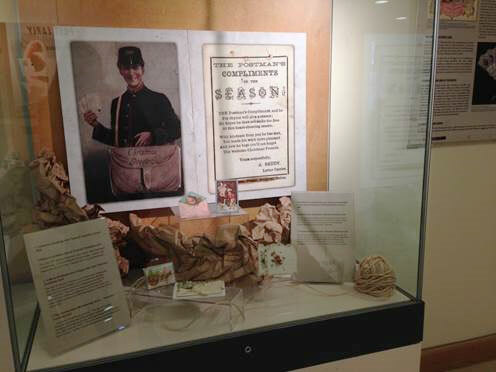 The exhibition, now on display at Beverley Art Gallery, explores the practise of sending post at Christmas time. 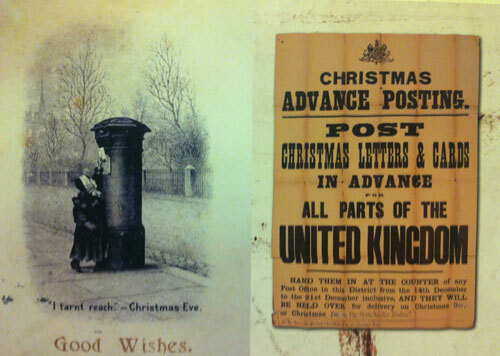 Christmas has been celebrated through the post for 170 years. The first known Christmas card was commissioned by Henry Cole in 1843, in the same year as Charles Dickens’s ‘A Christmas Carol’, was published. The BPMA holds one of Cole’s 1843 cards in its collection. Christmas through the post at Beverley Art Gallery reveals Christmas postal history through a series of images drawn from the collections of the BPMA. On display are iconic images of ‘Post Early for Christmas’ posters and images of Victorian Christmas cards within the BPMA collection. 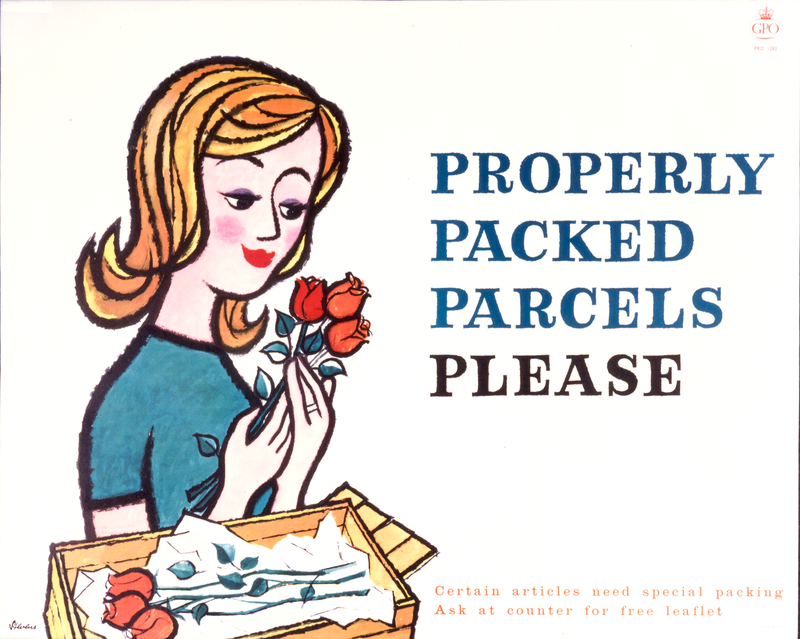 Promoting early posting for Christmas is the longest running campaign in Royal Mail’s history. 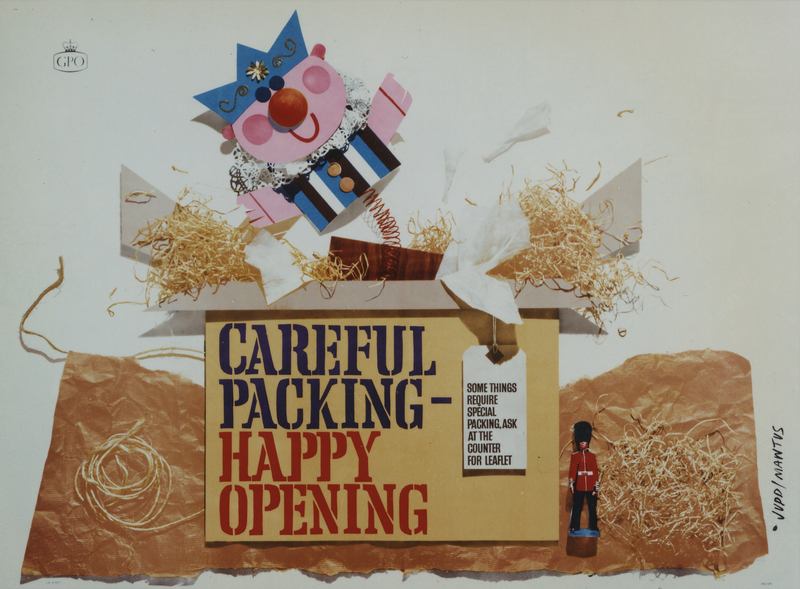 The images in the exhibition are taken from the iconic GPO advertising poster collection, held at the BPMA, illustrating the promotion of the services offered by the GPO and the campaign to encourage people to ‘Post Early for Christmas’. The images on display are testament to the breadth and variety of designs that have been used in the ‘Post Early’ campaign, for over 100 years. Also on display are a small selection of Victorian Christmas cards- illustrating the naturalistic and often pagan designs of the early cards, and their very small size, compared to today’s cards. 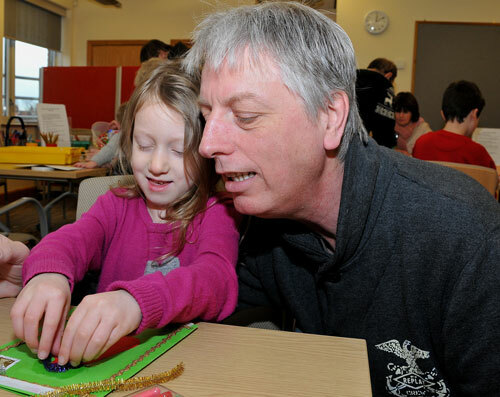 We also have on display Christmas stamp artwork facsimiles illustrating the designs and creativity of the Christmas stamps and the festive designs by children. Christmas stamps were only introduced in 1966 but remain the most popular stamp sets sold throughout the year. Following the first Christmas stamps in 1966, special Christmas stamps have continued to be issued every year- with designs of either a religious or a secular nature (largely alternating between the two). 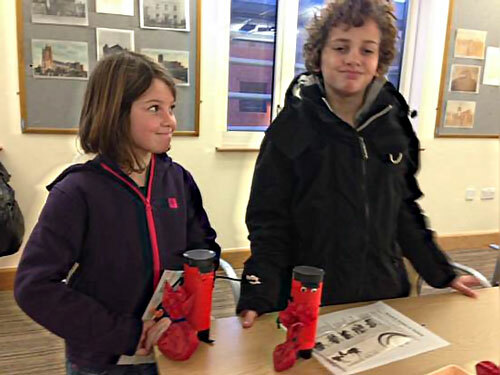 Festive worksheets and activities will be available to accompany the exhibition at Beverley Art Gallery. You can also download the BPMA children’s worksheet designed by Katy Holmes – http://www.katypotaty.co.uk. If you are unable to make it to Beverley to see the exhibition, we are very pleased to offer here an alternative online Christmas exhibition – our second online exhibition in collaboration with the Google Cultural Institute. 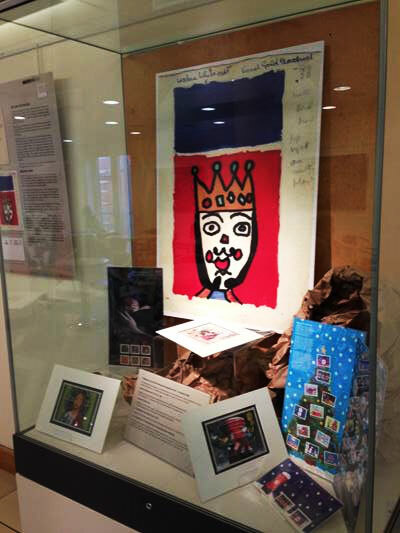 An exhibition case at Beverley Art Gallery features the first Christmas stamp designed by children. Christmas through the post is on at Beverley Art Gallery until 8 February. For more information on any of our exhibitions- we have four available for free hire- please contact Dominique on dominique.gardner@postalheritage.org.uk or on 0207 354 7287. A very happy Christmas from everyone here at the BPMA! It’s the oldest and one of the most famous railway networks in the world, now the London Underground celebrates its 150th birthday on Royal Mail’s first stamp issue of 2013. Issued today, the London Underground issue features ten stamps; six charting the history of the network, alongside a miniature sheet of four long-format stamps focusing on the design heritage of its iconic posters. The issue date coincides with the anniversary of the opening of what was to become London’s Underground: the steam-driven Metropolitan Railway running between Paddington Station and Farringdon Street via Kings Cross. On 9 January 1863 the Metropolitan Railway opened, passengers were able to use the service from 10 January 1863 and within months 26,000 people were using it every day. Fittingly it’s the Metropolitan Railway that features on the first of two 2nd class stamps, while the other shows railway workers, or Navvies as they were known commonly, excavating a tube tunnel. London Underground, 2nd Class stamps – 1863 – Metropolitan Railway Opens. A contemporary lithograph of a steam locomotive on the Metropolitan line near Paddington Station. 2nd Class – 1898 – Tunnelling Below London Streets. Railway construction workers, known as Navvies, shown excavating a ‘deep cut’ tube tunnel. Edwardian commuters travelling in from the suburbs are depicted on one of the 1st class pair of stamps, while the other features the Piccadilly Line’s Boston Manor, an example of many art deco stations built in the 1920s and 30s. London Underground, 1st Class stamps – 1911 – Commute from the Suburbs. A carriage of Edwardian ladies and gentlemen illustrated on their commute to work from the suburbs. 1st Class – 1934 – Boston Manor Art Deco Station. Suburban expansion of the Piccadilly Lines in the 1920s and 30s led to the construction of many iconic art deco stations. Classic rolling stock travelling on the tube’s ‘deep cut’ lines in 1938 and Sir Norman Foster’s Canary Wharf Station make up the £1.28p pair. London Underground, £1.28 stamps – 1938 – Classic Rolling Stock. The classic trains introduced on the tube’s deep cut lines in 1938 became a London icon. £1.28 – 1999 – Jubilee Line at Canary Wharf. Designed by Sir Norman Foster Canary Wharf Station is one of the most recent additions to the Underground network. Each of the stamps features a timeline across the lower quarter of the stamps using different livery colours taken from London Underground lines. 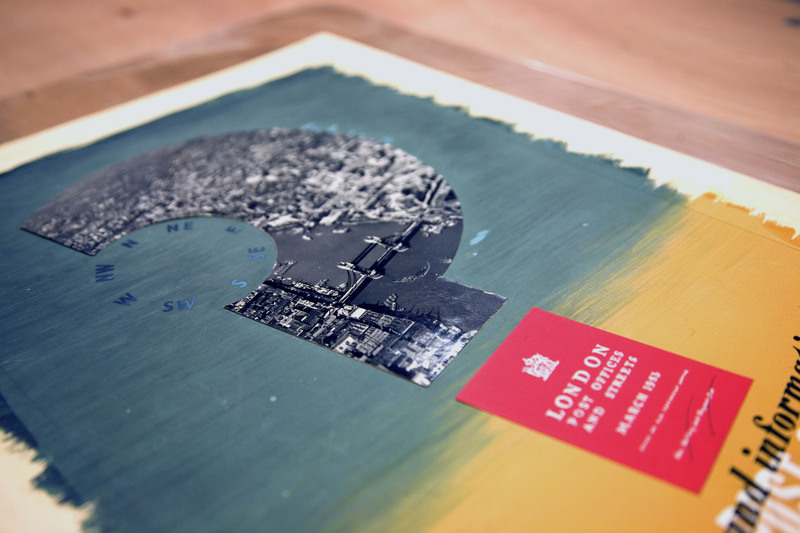 The miniature sheet features a total of 12 classic London Underground posters across four long-format (60mm x 30mm) stamps. London Underground miniature sheet. 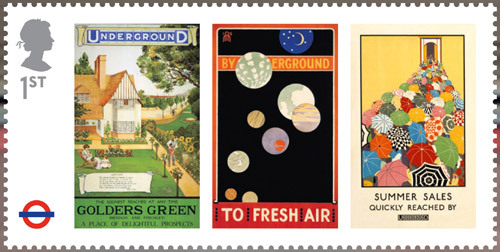 1st Class stamp – London Underground Posters – Golders Green, By Underground to fresh air and Summer sales. Reproductions of three classic London Underground Posters: Golders Green (1908) by an unknown artist 1908; By Underground to fresh air (1915) by Maxwell Armfield; Summer Sales (1925) by Mary Koop. London Underground miniature sheet. 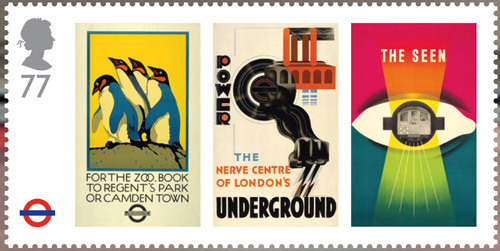 77p stamp – London Underground Posters –For the Zoo, Power and The seen. Reproductions of three classic London Underground Posters: – For the Zoo (1921) by Charles Paine; Power (1931) by Edward McKnight-Kauffer and The seen (1948) by James Fitton. London Underground miniature sheet. 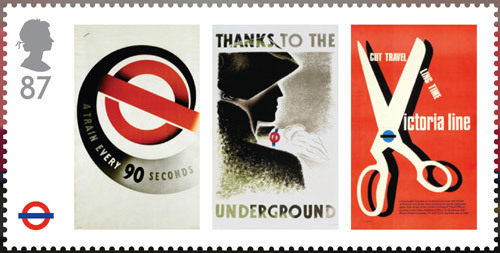 87p stamp – London Underground Posters – A train every 90 seconds, Thanks to the Underground and Cut travelling time. Reproductions of three classic London Underground Posters: A train every 90 seconds (1937) by Abram Games; Thanks to the Underground (1935) by Zero (Hans Schleger) and Cut travelling time, Victoria Line (1969) by Tom Eckersley. London Underground miniature sheet. 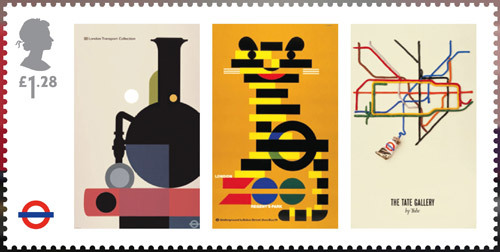 £1.28 stamp – London Underground Posters – The London Transport Collection, London Zoo and The Tate Gallery by Tube. Reproductions of three classic London Underground Posters: The London Transport Collection (1975) by Tom Eckersley; London Zoo (1976) by Abram Games and The Tate Gallery by Tube (1987) by David Booth (Fine White Line Design). The London Underground has a unique status as the oldest and one of the busiest underground railway networks in the world. For this first stamp issue of 2013 we have tried to capture the incredible history behind ‘the Tube’, which for millions of people is an integral element of their daily lives and an iconic part of London’s identity. Both London Underground and Royal Mail share a rich and extraordinary design heritage, so it’s a wonderful opportunity to celebrate a dozen classic Underground posters, featuring several artists who also designed posters for the General Post Office (GPO). 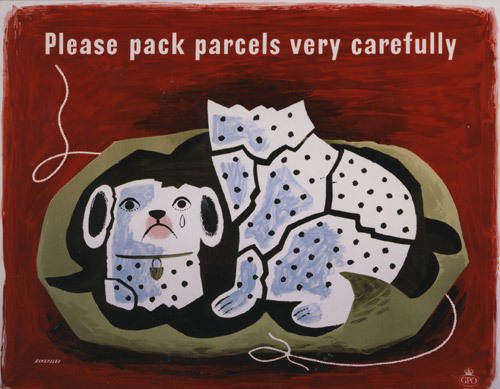 Please pack parcels very carefully, a poster designed for the GPO by Tom Eckersley. Several of Eckersley’s posters appear on the London Underground miniature sheet. 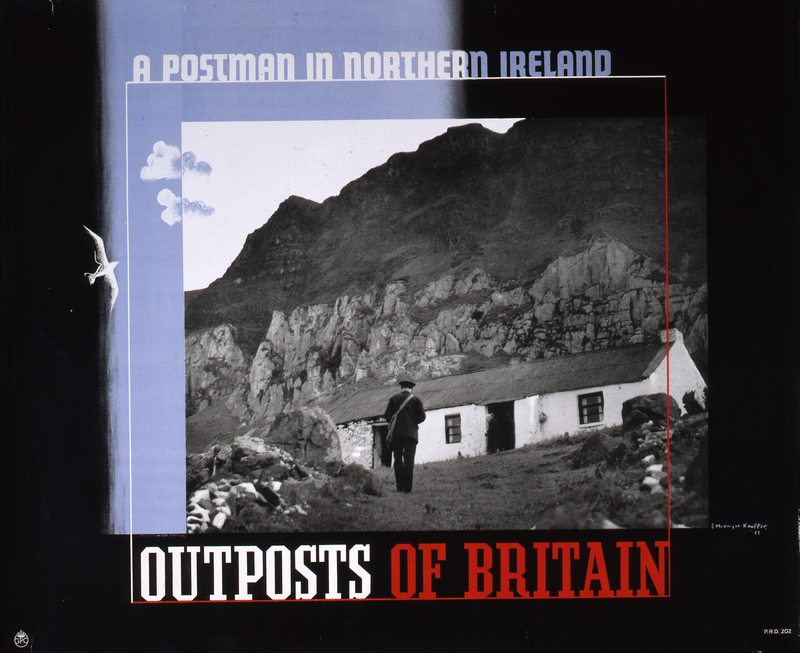 You can see a selection of GPO posters in our online exhibition Designs on Delivery. The Design on Delivery exhibition will be seen at the Great Western Hospital, Swindon, from 19 March as part of the Paintings in Hospitals scheme. Royal Mail stamps and stamp products are available at most Post Office branches, online at www.royalmail.com/underground and from Royal Mail Tallents House (tel. 08457 641 641), 21 South Gyle Crescent, Edinburgh, EH12 9PB.